As you head out to this weekend’s Halloween festivities, remember to avail yourself of public transportation, taxis, or ride-sharing services if you plan on drinking. But hey, being responsible doesn’t mean abandoning the spirit of the season. This year, consider puking in the backseat of a Lyft with a spooky fun Stranger Things theme! On October 27 and 28, between the local hours of 4 and 9 p.m., Lyft—the less morally questionable, Upside Down version of Uber—will offer customers the option to put their ride into “Strange Mode.” The creepy, crawly, corporate-y cross-promotional fun begins on the Lyft app, where all of the little car icons will be transformed into Stranger Things-related bric-a-brac, including waffles, a trucker hat modeled after Dustin’s, Christmas lights, and the glowing red neon of the show’s logo. 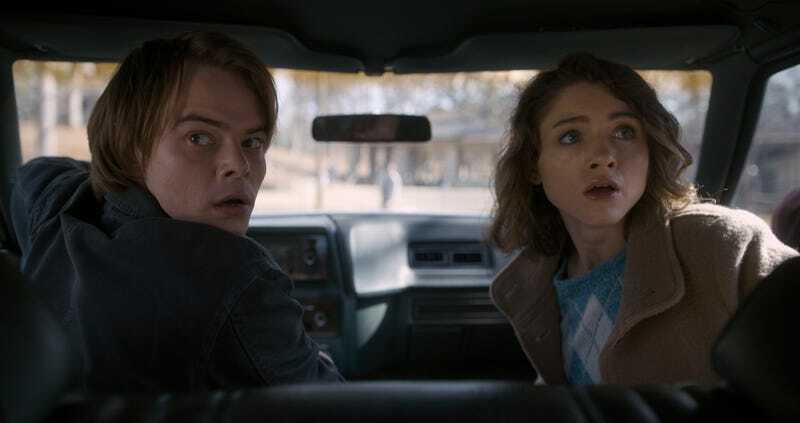 But as the preview video shows, the real “Paranormal Ride” begins once you’re inside, where your driver’s intrusive chitchat will be wholly Stranger Things-related, all as a prelude to waylaying your journey by pulling over to barf up a slug. The locks and seats will then begin to malfunction, the interior lights will flicker, and the ceiling will pulsate, as the combination of terror and disorientation causes your confused friend to vomit up their own, earlier slugs of cheap vodka. Your Lyft driver will then hand you an “Eggo reward,” which you can use to sop it up while haggling over the $250 cleanup fee. Unfortunately, Lyft’s Stranger Things promotion is only available in Los Angeles and Philadelphia, meaning riders in other cities will have to settle for their regular, shame-themed Lyft puking. You Can Puke On Our Stranger Things Coverage, Too!